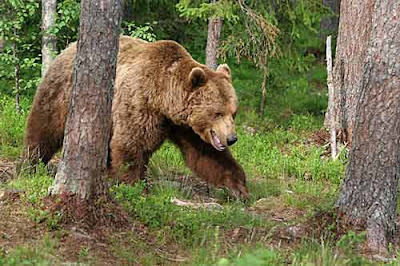 Several news outlets have reported that at least one bear in northern Russia was seen digging up a decomposing human body in a cemetery recently. The brown bears, which normally feed on forest berries and mushrooms, have had to come closer to human settlements to look for food, leading into their winter hibernation. The loss of the bear's natural food sources is a result of the devastating fires and heat that Russia experienced this past summer, marking it as the country's hottest summer on record. Unfortunately, the raging fires, drought and heat in Russia have been linked as a consequent of climate change; with the recent news of bears digging through grave yards, an unfortunate example of wildlife losing their habitat and food sources. This of course will naturally drive wildlife to move further into human populated areas, in their search of food. If man made climate change continues to grow, what other animal species could and have we affected? For more information about the link between climate change and the summer fires in Russia, click here for an article by 'The Economist'. To check out one of the articles of the many articles which reported the news about bears digging up graves, click here.